Social interaction among neurotypical people is complex and in many ways illogical. To the person with Asperger Syndrome (AS) it is also woefully unintuitive. In this book, adults with AS discuss social relationships, offer advice and support for others with AS and provide necessary insights into AS perspectives for those working and interacting with them. * the opportunities provided by social skills workshops or interest groups. This is essential reading for adults with AS, their family and friends, as well as service providers and other professionals providing support for people with AS in adult life. Preface to the Series. Genevieve Edmonds. Introduction. Luke Beardon. 1. One-Channel Communication: Developing Social Relations Online. Chris Mitchell. 2. Developing a Better Social Understanding. Steve Jarvis. 3. The Difficulty of Social Contact and the Impact on My Mental Health. Hazel D.L. Pottage. 4. 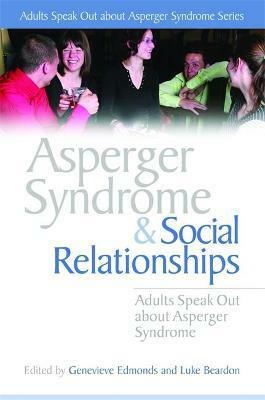 Social Relationships for People with Asperger Syndrome: How to Help People Understand. Giles Harvey. 5. Social Relationships and the Communication Problem. Neil Shepherd. 6. Social Relationships and Social Inclination. Alexandra Brown. 7. The Social World and Me. Kamlesh Pandya. 8. Aspie Village: A Web-Based Social Forum. Dean Worton. 9. Understanding and Enjoying Successful Social Relationships. Wendy Lawson. 10. Socialising 101 for Aspies. Liane Holliday-Willey. 11. Making Friends is Not Easy. PJ Hughes. 12. Social Relationships I've Had and From Which I've Learned. Vicky Bliss. 13. Asperger Syndrome and Social Relationships: My Experiences and Observations. Anne Henderson. 14. A Stranger in a Strange Land: A Journey Through the Social Weirdness of the Neurotypical. Cornish. List of Contributors. Index. Chris Mitchell was diagnosed with Asperger's Syndrome in 1998, when he was 20 years old. Having completed an MA (Hons) in Information and Library Management, he currently works at Durham County Council. He is an active advocate for raising awareness of the positive aspects of AS, giving talks, seminars and workshops throughout the UK. He also offers mentoring and support services for school leavers and students entering higher education with AS. Chris has written an autobiography of his own experience of AS, entitled Glass Half-Empty, Glass Half-Full: How Asperger's Syndrome Has Changed My Life and practices meditation in his spare time. Dr Wendy Lawson, a psychologist, qualified counsellor and social worker has operated her own private practice for many years. Wendy was awarded fourth place as aEURO~Victorian Australian of the year' in 2008. Originally diagnosed as being intellectually disabled, then in her teens as being schizophrenic, and finally in 1994, Wendy was diagnosed as being on the autism spectrum. The mother of four children, Wendy has been married, separated and divorced, has experienced the death of one of her teenage sons, lost friends and status due to being openly gay, faced ill health and recently is coming to terms with the fact that she is aging! Wendy's youngest son is also on the autism spectrum.